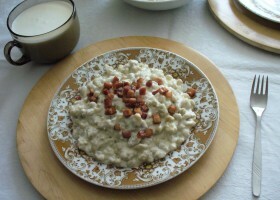 Bryndzové Halušky is one of the national dishes in Slovakia.This hearty meal consists of Halušky (boiled lumps of potato dough similar in appearance to gnocchi) and bryndza(a soft sheep cheese), optionally sprinkled with cooked bits of smoked pork fat/bacon. Žinčica is traditionally drunk with this meal, it’s a sheep’s milk whey and is served in a wooden cup. There is an annual Bryndzové Halušky festival in Turecká that features an eating contest. Bryndza (Slovak Sheep Cheese) – or use feta cheese mixed to a paste with cream cheese if you cant get authentic Bryndza. Add egg and flour. You need to make dough that is not watery but also not tough. If it happens to be too watery, add more flour; if it is too tough, add some water. carve off small bites of dough with a teaspoon or with a knife on a chopping board and gently roll each piece then toss pieces about 2,5 cm (an inch) long into the boiled water. Put the fried bacon on the top of halušky (with a bit of the pan grease) before serving.